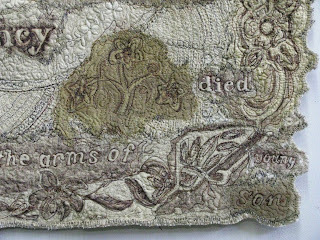 Art In Stitches: New Work! I'm almost back to normal...whatever that state of existence is! CYBER FYBER 2 is in the future and new, personal work is being completed. Stitch after stitch I plan for a future, think about potential installations, and dig deep into my hidden ideas in search for excellence. 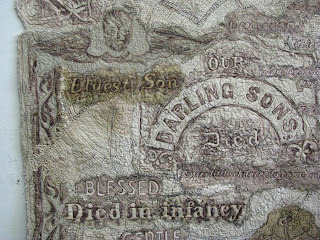 The grave rubbings I made in Maine are currently my focus for both hand and free-motion machine embroidery. The trip to Savannah and its Bonaventure Cemetery are fueling each running stitch....like the kantha clothes in Indian, I feel a sense of memory, softness, and personal investment. I've started two more pieces in this series too! 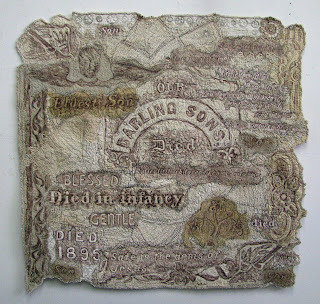 Beautiful work Susan, it must be really lovely to work on your own textile art again. This is seriously cool stuff. 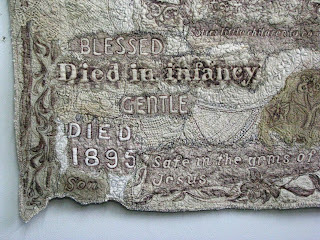 I love old gravestones and I have been thinking of trying to rub onto fabric. This si pretty inspiring. I will try it in the spring. wonderful! the backs are such a beauty as well. 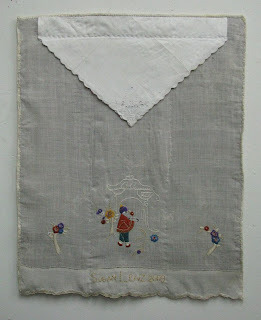 I love your graveside pieces, especially the use of vintage linens. I love a visit to an Op (charity) shop, so many stories, so much history. I wonder, however, how these pieces might affect those who maybe have lost a child. Luckily we have not been in that position but I have friends and relations who have lost children at various stages through death or drugs/peer influences and I know it is devastating. 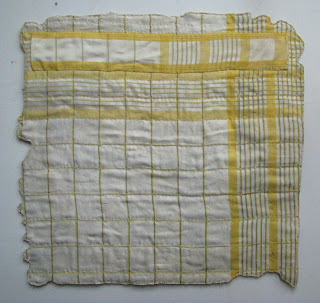 These are really compelling, I love the texture and the neutral colour realy appeals to me and compliments to topic. The background is justlovely. This is a beautiful sensitive piece. I love the backs too.